Heat skillet or griddle to medium-high heat. In a second bowl combine the milk, oil and vanilla then add to the dry ingredients. Thoroughly combine until the batter is smooth. Gently fold in the strawberries and chocolate chips. Spray the griddle and then scoop 1/3 cup of batter. Let cook until bubbles appear across the top of the batter and the edges appear firm. Carefully flip and cook for another minute or two and remove. 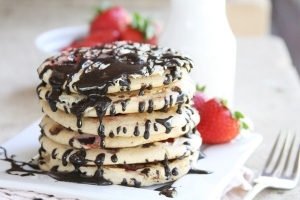 While the pancakes cook, prepare the chocolate sauce. Combine the honey, cocoa powder, and milk until well combined. Drizzle one tablespoon on top of the pancakes in place of syrup. Try 13 Healthier Breakfast Recipes in our Baker's Dozen eCookbook, including these pancakes and Apple Cinnamon Streusel Doughnuts.